New York Jets quarterback Tim Tebow has reportedly accepted an invitation from incoming Winnipeg police chief Devon Clunis to serve on the Winnipeg Police Board. 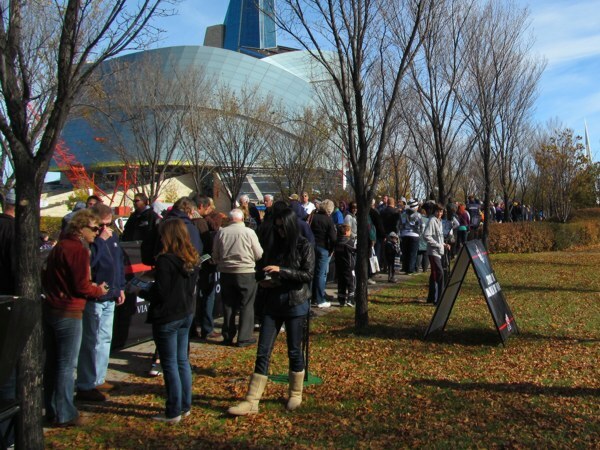 The outspoken Christian athlete will join a panel of Winnipeggers in advising the Winnipeg Police Service. 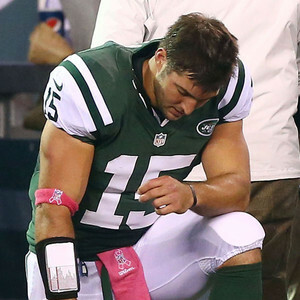 Tim Tebow in prayer during a recent NFL game. The announcement was well received by community leaders. Clunis is expected to be formally sworn in as the Chief of Police next month. Tebow will begin his duties following the current NFL season. 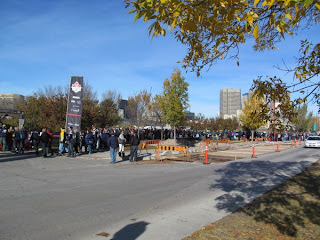 There is something weird to be seen in every visit to downtown Winnipeg. While washing my hands in the washroom at Cityplace, a man comes up to the sink beside me after using the urinal. He wets the tips of his fingers and sticks them up his nose. I didn’t bother to ask what he was trying to find as he ferociously gouged out the inner sanctums of his nose through both nostrils. 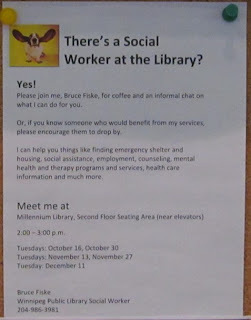 The library apparently now has a social worker. When you think “library”, you think books. Magazines. Encyclopaedias. Reading. Writing. Research. Not so in the capital of the Socialist People’s Republic of Manitoba. 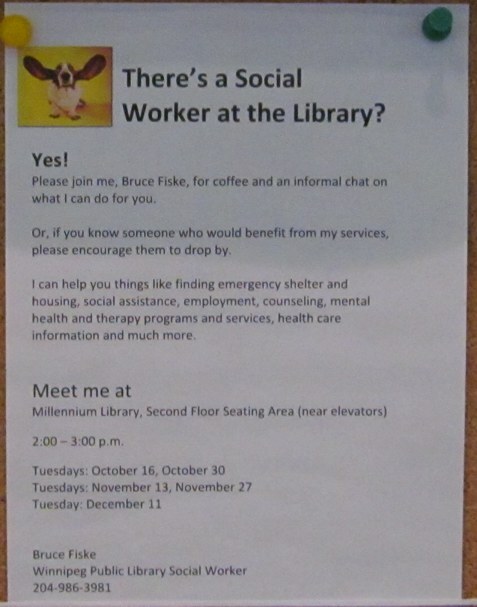 Now, it’s a resource center to help you, as the sign says, to find housing, welfare, or the more politically-correct euphemism “social assistance”, employment and counselling. The list goes on ad nauseum. These services, if they are needed at all, shouldn’t fall within the scope of any municipal government, let alone a public library. 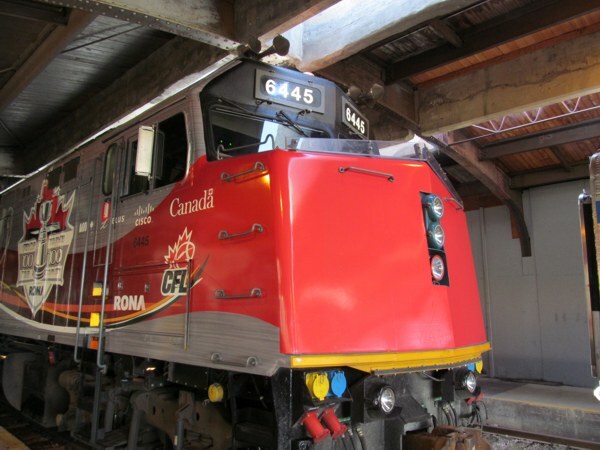 While the councillors and the mayor keep patting themselves on the back on how efficiently they run the city, they authorize frivolous, redundant and no doubt expensive services like this. Next time you wonder why your taxes are so high, add this to the multitude of reasons. Last Thursday, I risked life and limb to visit the Winnipeg Free Press News Café, located in the heart of the Exchange District. 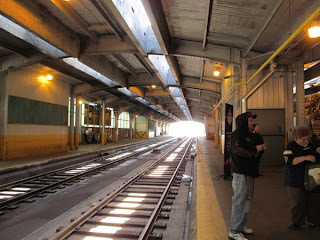 The most newsworthy part of the story to come is that I survived without being mugged, stabbed, or shot. 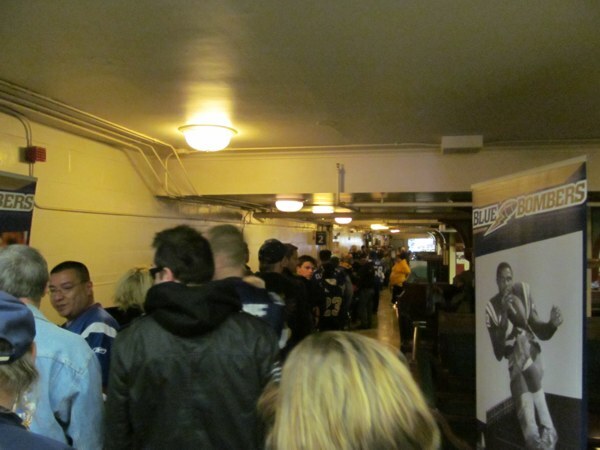 The occasion that brought me to this exceptionally crime-ridden area of Canada’s armpit was a gathering of five members of the original Jets squad on the 40thanniversary of the first game played in the history of the WHA. 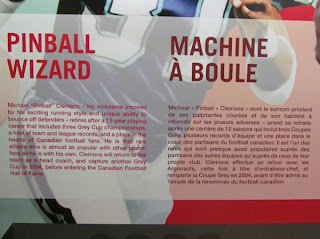 I wrote an article on the evening for the WHA Hall of Fame and recorded 41:00 of the interview on my camera. For the article, pictures and accompanying video, please click here. Under the mistaken belief that many hockey fans would have made the effort to come and hear these former Jets share some priceless stories from the WHA years, I arrived exceptionally early in order to get a good seat. Sadly, I was wrong. I could have arrived midway through their interview with reporter Geoff Kirbyson and I could have had the pick of any seat in the house. Perhaps there was a larger contingent watching the interview online, but it had to be disappointing to the players to see not more than 10 or so people scattered throughout that run-down hole in the wall. I can certainly understand the hesitation in venturing anywhere in the downtown area, but this was a priceless opportunity to meet these Jets legends and hear them give us an insider’s view of the best era of Jets hockey. I was glad that I made that effort and the many of you who weren’t there missed something special. 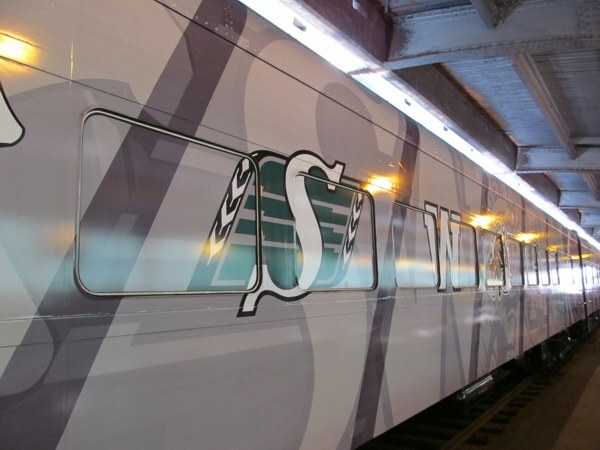 Today, I ventured over to Union Station to see the Taxpayer Trophy Train as it stopped in Winnipeg as part of a cross-country tour. 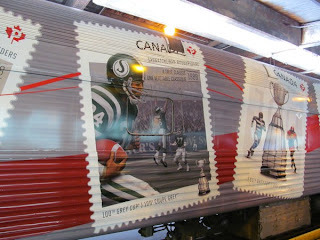 You might know it as the Grey Cup Train. I’ll state up front that I am not a fan of the Taxpayer Football League, nor am I a fan of being an involuntary sponsor of its local team. So why would I go? I used to be a fan. I have the beer that a group of unruly firefighters threw on me to prove it. 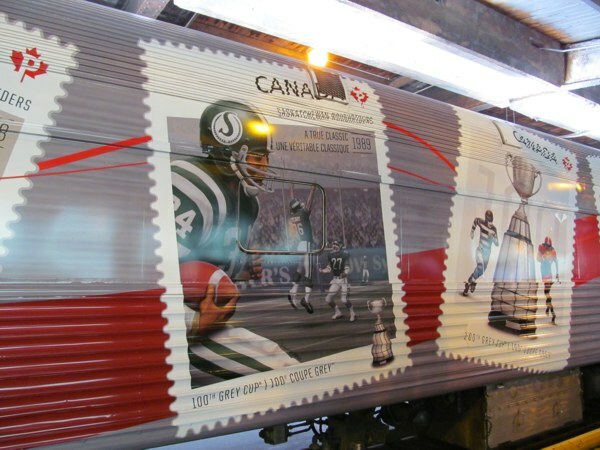 I have somewhat of an appreciation for the past history of the league and, additionally, I have an adopted fondness for trains, so I decided to check it out. 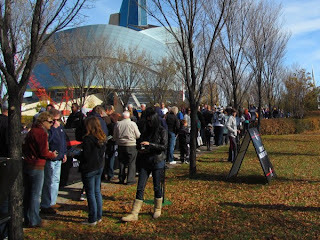 Upon my arrival, I was shocked to see the lineup just waiting to get in. 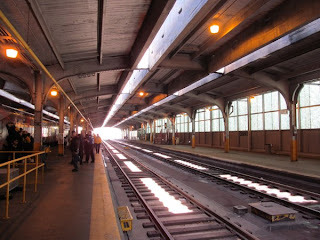 It was no better inside Union Station. The Bombers had their mascots around and they some posters on display throughout the station. 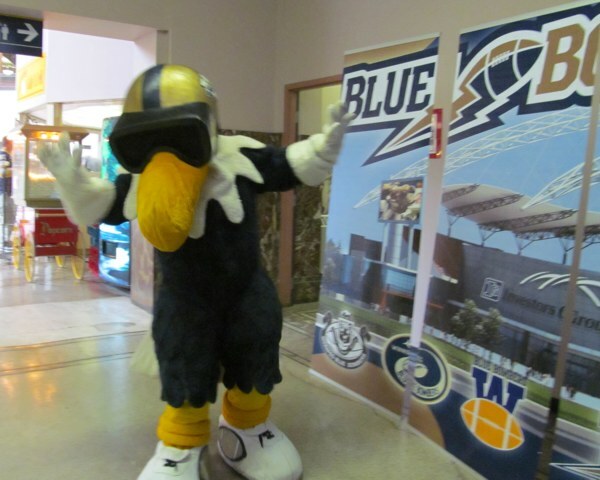 This is “Buzz” and at right is a poster for Manitoba Taxpayers Stadium II. Thanks for the reminder. I can only imagine how much of a kick in the gut it must feel like for people who live in Fort Richmond. After waiting about 45 minutes, I got up to the platform and saw the train. 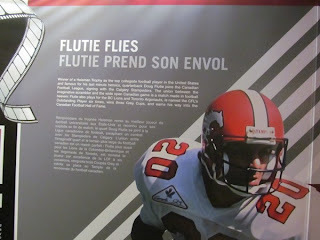 This section dedicated to Doug Flutie was the highlight for me and an unexpected bonus. I never watched Flutie play in the TFL, but I was very dedicated fan of the USFL’s New Jersey Generals, the team that he made his pro debut with in the spring of 1985. 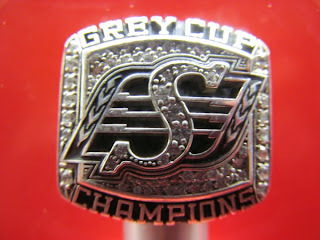 This is a picture that I’ll probably use in the book I plan to write on the Generals’ three-year history. Is it “Michael” or “Micheal”? Farmers’ Republic of Saskatchewan Roughriders – Grey Cup Champions. More from our western neighbors. Outside on the platform, I took a couple of shots showing where the trains roll into the station. This is not an area where the public normally gets to visit without a train ticket, which is one of the reasons that I decided to attend. I also took note of a pair of jerseys hung out on the platform. 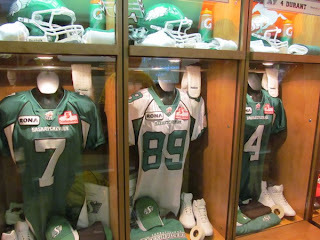 Fans had the opportunity to stand behind the jersey and have their picture taken in a Roughrider uniform. 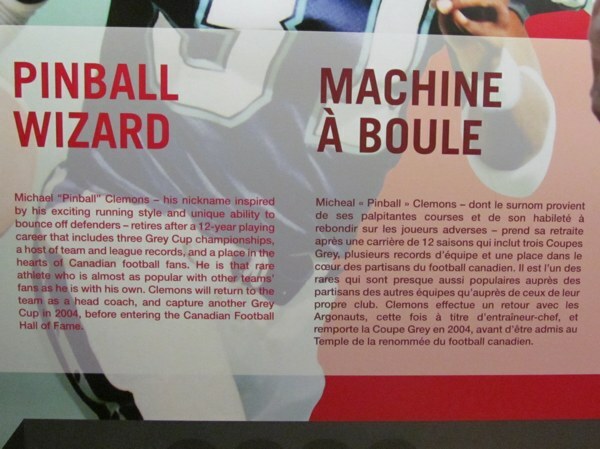 There was a Blue Bomber jersey right next to it as well. Upon leaving the station, I noticed the lineup outside. I was relieved that I came early. I can only imagine how long these people had to wait to get on the train. 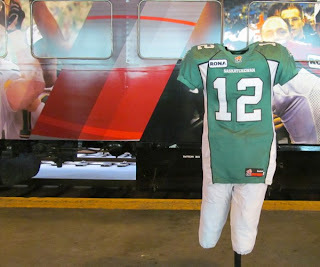 To my surprise, the actual Taxpayer Trophy wasn’t on the train, but outside in one of the displays. I came for the train and I had no need to make a special effort to see it, so I left to return home. Despite the crowds, I was glad that I went. I hear that Winnipeg will be having a new police chief soon. I only hope that’s true. In reality, the office of chief of police has been vacant for more than a decade. Under the virtually non-existent leadership of the people who have been occupying that position, Winnipeg Police Service has transformed itself from a respected law enforcement agency into a self-serving Crown corporation. Law enforcement has been so laggard that a culture of entitlement to break the law has enveloped the entire city. People do as they please because they know that there are no consequences for their actions. A police cruiser could drive right by and would turn the other way at the sight of a crime, big or small. I’ve seen it happen. Oh sure, police are in full force when there’s major accident. They’re stringing their yellow tape, covering a five-mile radius around the accident scene. And they’ll sit there blocking the scene for the better part of a day or more. Because they can. And they’ll give you a snarly attitude to go with that. If you dare object, they cry foul. You don’t respect law enforcement. Sadly, law enforcement and the WPS have long since parted company. It’s no wonder that the vacant chief of police position did not attract many good candidates. It’s a job that needs a take-charge person. Someone who is willing to take on the challenge of his or her career. It is not a “mind the store” job. I hope that Devon Clunis has what it takes. Because Winnipeg doesn’t need a football stadium. It doesn’t need more festivals. It desperately needs a law enforcement agency more than anything else. I have a sinking feeling that it’s not about to get one anytime soon.